For bulk orders or printing requirements please contact our sales team. 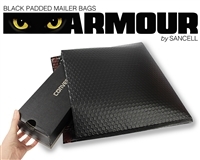 Make sure your entire range of mailers, packaging and courier bags are better secured and styled. protectivemailers.com.au is a leading online store with expertise in supply and distribution of quality Protective Mailers, courier bags, courier satchels, paper and poly bubble and padded mailers. Our protective envelopes and protective packaging products are of the highest quality as we deal only in premium brands including Jiffy, Sancell and Nomad. Each brand we offer has been in the industry for a very long time and is known for providing quality products for safe packaging and mailing. Whether the concern is material, size, corner safety, edge safety, seal or weather proofing etc, we have the best suitable protective mailers and protective bags to offer. Despatched goods during their journey come across many different risks - breakage, folding, scratches, moisture, tear etc. Sometimes, you need to store your goods for a long time and during this period you need to rearrange the stock. In both cases, packaging plays a critical role. Our range of courier bags, courier satchels and padded mailers provide the security against all the possible risks associated with handling, transportation and storage. You may ask us to supply the protective bags, envelopes, mailers and packaging products with customized printing of your logo, brand name, promotional deals or popular slogans. Our experts are always happy to suggest the best in style cost effective packaging and despatch solutions encompassing complete line of protective mailers - paper bubble mailers, jiffy padded mailer, poly bubble envelopes, security bags, postage bags, courier satchels, courier bags etc.